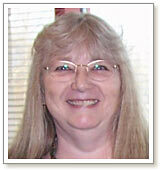 Jeanette Shanigan is designer-artist, teacher and author of many beading books and patterns. She has a ''compulsion to share'' her techniques through teaching. Her classes and books feature eye-catching, wearable designs intended to inspire everyone who looks at them. Most notably, Jeanette is an advocate for breast cancer awareness and research, using her artistic skills to help raise money for this important cause. In 1985, Jeanette lost her mother after a long battle with breast cancer and has since become an advocate for finding a cure. Jeanette has dedicated herself to donation efforts and raising money and awareness for researching a cure. She started the Bead it Forward project in which artists submit small beaded squares that Jeanette combines into beaded quilts. 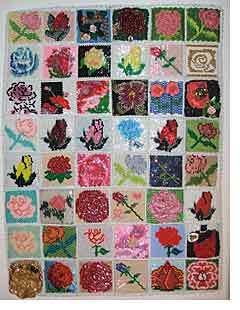 The quilts are then donated to the Bead Artists Against Breast Cancer (BAABC) auction at the social held during the Bead and Button show. Each year has a different theme, adding awareness and further defining and celebrating each woman's struggle with breast cancer. In 2007, Jeanette was strongly moved by the idea that more money could be raised if only more people were involved. So, she decided to invite others, via the Internet, to join her in her efforts so that more quilts could be made to raise even more money. She uploaded patterns that support the year's theme and size specifications on her website so others could easily participate. After many email campaigns and online outreach efforts, Jeanette was shocked by the international response as designer-artists at every experience level stepped forward from over six countries and 34 states to participate. Jeanette received 374 squares from 222 bead artists for the 2007 project. She combined the squares together to create 13, 10 x10-inch quilts. The quilts were framed in shadow boxes and auctioned off to help raise over $20,000 at the BAABC auction. To view more of Jeanette's amazing designs and for information on her patterns, books and teaching schedule, or, if you are interested in submitting a square to the Bead it Forward project visit her website at http://shanigansbeadshenanigans.com/. View all of Jeanette's designs in the Gallery of Designs.